Back to the beach! After their destination wedding in Sarasota, FL, Josh and Jayme needed another set of invitations for their wedding reception back in their hometown of Duluth. We decided to keep the keep the theme the same and use a photo from the wedding on the invitation. I have to toot my own horn on this one because I actually shot their wedding! Not something I normally do, but it was definitely a fun experience. This invitation was a little more simplistic – it was one single card printed on an off-white linen cardstock and adhered to a cranberry colored gatefold enclosure. Because we had twine and a little beachgrass paper leftover from the wedding invitation, I sealed the gatefold by wrapping it in twine and sealing the ends with a starfish design over the beachgrass paper. The RSVP postcard fit nicely inside the enclosure and we mailed the invitation in a silver metallic envelope. And just because I took the photos, I have to share my favorite one from the wedding – seriously how cute are they? Brittany and Jonathon came to BB10 Creative looking for creative invitations that would integrate their peacock/peacock feather theme of their wedding. They were using a rich violet color as their main wedding color paired with a darker teal accent. The resulting design is stunning and extremely elegant. We used a very ornate and detailed peacock feather illustration with a gradient purple-to-teal color scheme. Although the feather is the main feature of the invitation, we also used a very subtle and elegant gray pattern in the background, adding to the formal feel of the invite. I paired a sans-serif typeface with a beautiful calligraphic script that matched the swirls and details of the peacock feather design. 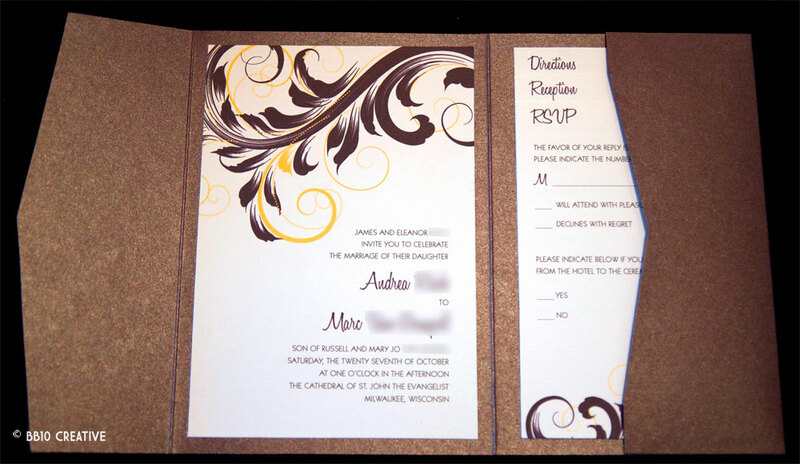 The invitation cards feature the same peacock feather design cascading over the tops, creating one solid design when the cards sit together in the enclosure pocket. The invitation was housed in a violet metallic vertical pocket enclosure and was sealed with a semi-transparent teal satin ribbon & monogram seal featuring the couples’ initials and the subtle background design. 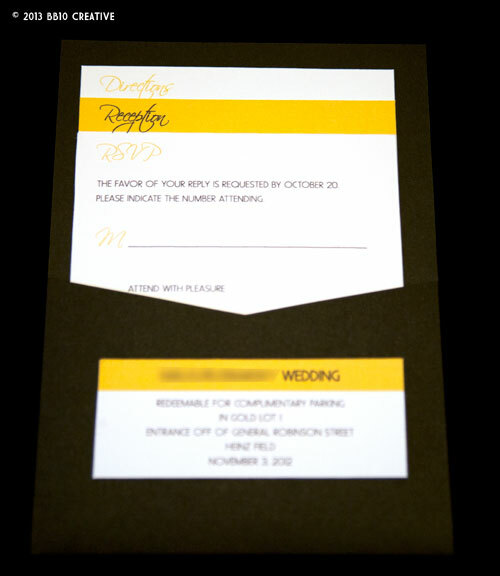 The invitation was mailed in a dark onyx metallic mailing envelope. Don’t forget to follow us on Facebook, Twitter and Pinterest for all the latest work as well as wedding invitation tips and other sources of wedding planning inspiration! Ann and Jason were already married in a small ceremony in Mexico and came to BB10 Creative looking for some fun and unique invitations for the wedding reception they were having for family and friends back home. They wanted fun, modern and simple invitations that reflected their ceremony in Mexico and used the colors of brown and silver with tropical green accents. The final design was a really fun and unique idea – I used a sheet of corrugated cardstock for the base of the invitation and adhered a long trifold card to the front. The folded card housed the RSVP postcard and was tied together with raffia – a great material to use when you have a tropical theme in mind! I used a simple palm tree design for the front, paired with a somewhat whimsical/tropical script font. As you unfold the top of the invitation, the date of the event is revealed in a very modern sans-serif font, with some subtle palm trees in the background. 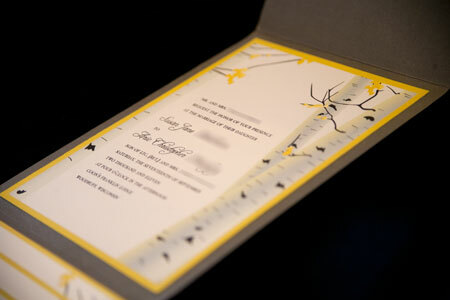 As you continue to unfold the bottom flap, the full invitation is revealed. On the inside, I used a combination of a display font, sans-serif and script for a really unique look. I also separated the invitation sections with fun little tropical icons and framed the invitation with a brown lattice design. The RSVP postcard mimics in the invitation design with the lattice pattern and palm trees. The invitation was mailed in a metallic brown envelope and came with a customized return address label on the back. This invitation is another fun example of how you can create something really unique and outside the “standard” cards in an envelope type of invite. More fun invitations to come! Josh and Jayme came to BB10 Creative for invitations for their destination wedding in Sarasota, Florida. They were going to be married at a small park and have the reception at a nearby marina, so they were looking for something with a beach/marina theme, and using the colors of cranberry red, ivory and silver. Although the final design for this invitation turned out to be fairly simple, the different layers of textured paper along with the starfish charm really help this invitation to stand out. I used a cranberry cardstock for the backing, then a layer of beachgrass paper, then a layer of silver metallic paper, followed by the invitation card itself, printed on a natural white textured cardstock. The starfish charm is tied onto a piece of twine and was adhered between the different layers of cardstock. We included a small RSVP postcard and mailed the invitation in a silver metallic envelope. The silver starfish charm was such a hit on the invitations that all of the women invited to the ceremony ended up putting them on silver chains to use as a necklace to surprise the bride! A second blog post for this wedding is coming soon – as there was a second invitation sent for the wedding reception back in the couples’ hometown of Duluth, MN. Yikes, I’m very, very far behind on blogging! There’s been a lot of new work I haven’t posted yet so watch for more new posts soon! I’m also right in the middle of updating the brand and the website, so there is lots of fun new stuff coming. For now let’s get started by talking about these beautiful lavender and silver wedding invitations! Jessi came to BB10 Creative looking for invitations to fit with her “romantic pearl” wedding theme. She wanted a more traditional invitation and was looking to incorporate either a lace or floral pattern and used silver and a lighter purple/lavender color. The final result was this lovely invitation that uses a very ornate floral/lace pattern with pearl graphic accents. The pattern was printed in silver and we used pops of purple to highlight Jessi and Joshua’s names along with the titles for each of the enclosure cards. I used a gothic style serif font paired with an ornate engraved style script to emphasize the formal look of the invitation. Each enclosure card title is book-ended with more pearls and underlined with a decorative horizontal rule. The invitation is house in a silver metallic pochette enclosure and when the two triangular flaps are closed, the “A” monogram at the top of the invitation stands out. The enclosure is held closed with a translucent belly band highlighting the wedding date over the subtle floral pattern. 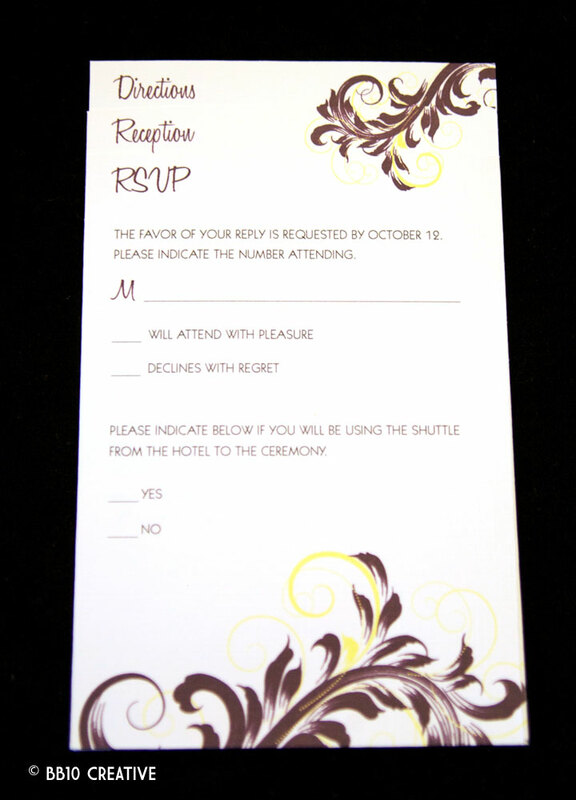 The invitation was mailed in a matching metallic purple envelope. Metallic papers really add sparkle and shine to your invitations and they definitely stand out in the mail! Back in January of this year, I received an email from a former client who was in charge of planning her sister’s wedding and was looking for some creative invitations on a budget. 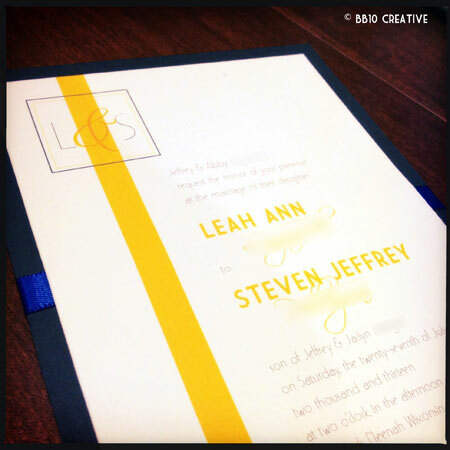 I was very flattered that she returned to BB10 Creative for invitations! 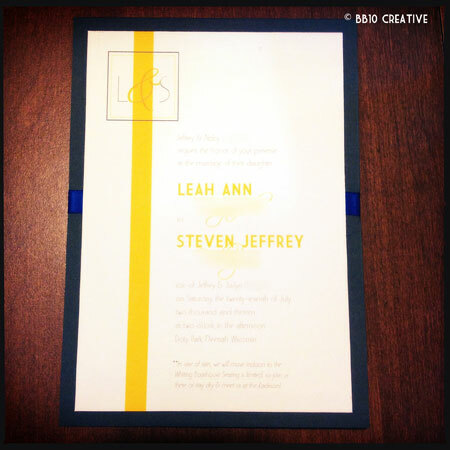 Leah, the bride, was looking for invitations to incorporate her wedding colors of yellow and gray, with accents of horizon blue. She wanted something simple, fun and traditional and was leaning toward the idea of using a monogram design. The final design chosen was a very simple design, using a the monogram L&S with a bold yellow stripe down the left side of the invitation. I used a modern sans-serif font with an art deco feel for the main text, and paired it with a modern script to highlight the couples names. On the accompanying cards, I added large but thin words down the side of the yellow stripe to indicate which card was which. 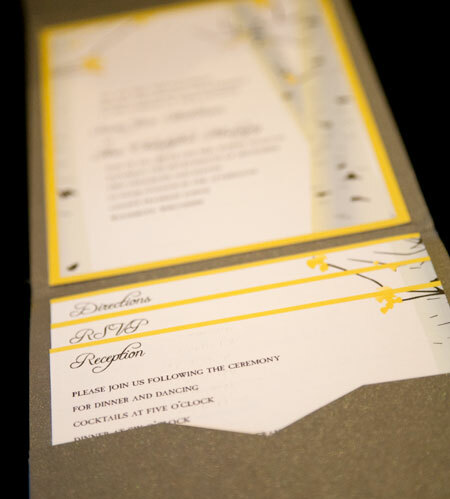 The invitation was printed on a clean white linen cardstock and was mailed in a bright yellow matching envelope. 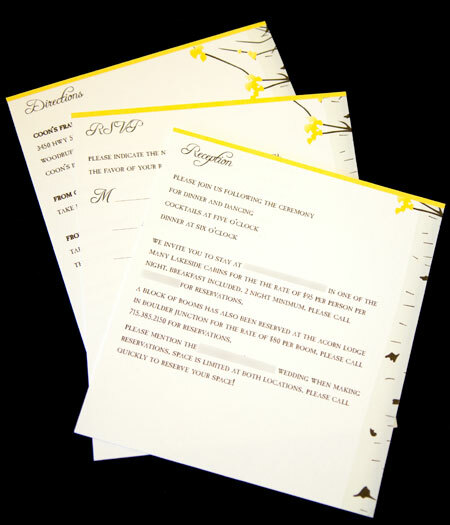 In order to help keep the invitations within her budget, we decided to forgo an enclosure booklet or pocket that you would normally see on a BB10 Invitation. Instead we used a single sheet of charcoal gray cardstock and adhered the invitation card to the front, also concealing the horizon blue ribbon behind it. 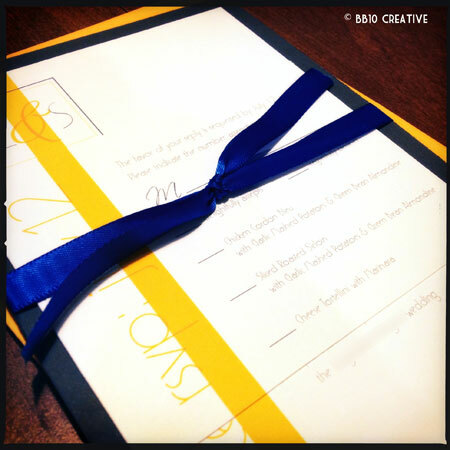 Then on the other side of the gray cardstock, we placed the remaining 3 invitation cards – directions, reception and an RSVP postcard – and secured them by tying a knot with the blue ribbon. This was a unique way to keep the invitation together without the use of an enclosure and allows for an overall cleaner presentation versus placing 4 individual cards into an envelope. One of my favorite things about this job is coming up with unique ways to create wedding invitations that not only reflect the personality and tone of my clients’ wedding day but also to help them stay under budget! I’m always happy to see how I can create something amazing for brides on a budget – contact BB10 Creative today! Thanks for reading and as always, don’t forget to follow us on Facebook and Pinterest to see all the latest work! Catching up on some old blog posts here! Last fall, Marc and Andrea came to BB10 Creative looking for some simple yet elegant invitations for their October wedding. They didn’t have anything too specific in mind other than wanting to incorporate their wedding colors of eggplant and light yellow, and to keep the design a mix of traditional and modern. For Marc and Andrea’s invitations, we ended up using an elegant scroll design in eggplant and yellow and housed the invitation cards in a pretty metallic eggplant horizontal pocket enclosure. I will fully admit the eggplant enclosures do not photograph very well, but I can assure you that they really are beautiful in person! 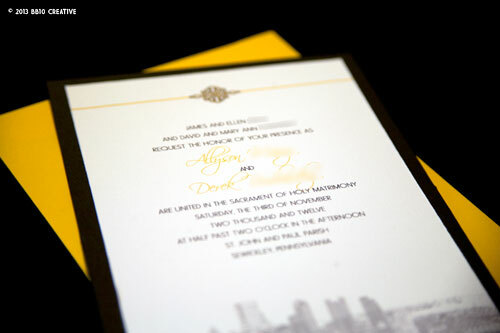 The invitation uses a semi-formal sans serif font paired with a retro script to highlight the couples’ names. The scroll design cascades down over the enclosure cards in the pocket, and the invitation was printed on a clean white linen cardstock. The invitation was mailed in a matching eggplant color envelope. More posts to come soon from all the invitations completed in 2013, including some unique beach theme invitations, and even a fun 40th birthday party invitation! Make sure to follow us on Facebook for all the latest info! Joanna and Andy came to BB10 Creative looking for invitations for their September wedding in California. 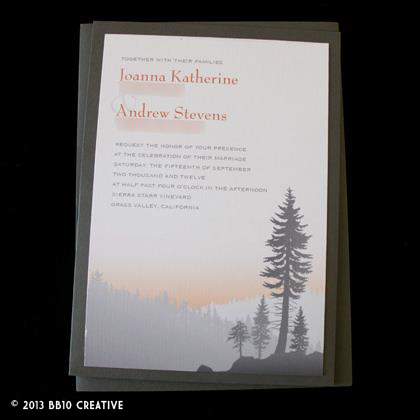 They had already created and sent a Save the Date card on their own, which displayed a picture of pine trees at sunset. They knew that their color scheme was going to be gray with hints of orange. I have to admit, I absolutely love using gray in designs, especially paired with yellow and orange. It’s always nice to select a neutral in your color scheme because they play so nicely with other colors that need to pop. Initially I went in a few different directions on this design for Joanna and Andy. I created a few designs that would coordinate with the save the date, a few that had a vineyard theme since the wedding was going to be held at a vineyard, and even a few with a poppy theme, as that was the wedding flower. 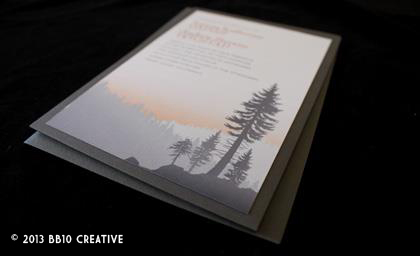 In the end they decided on a design that coordinated with their save the date, selecting a design of pine trees and hills at sunset. We actually chose a fixed width sans-serif font paired with a classic serif. The pine tree design cascades over the cards in the pocket in the back and orange is subtly used for accent text. They really wanted a simple invitation, so we decided on using a newer type of enclosure, a panel pocket. 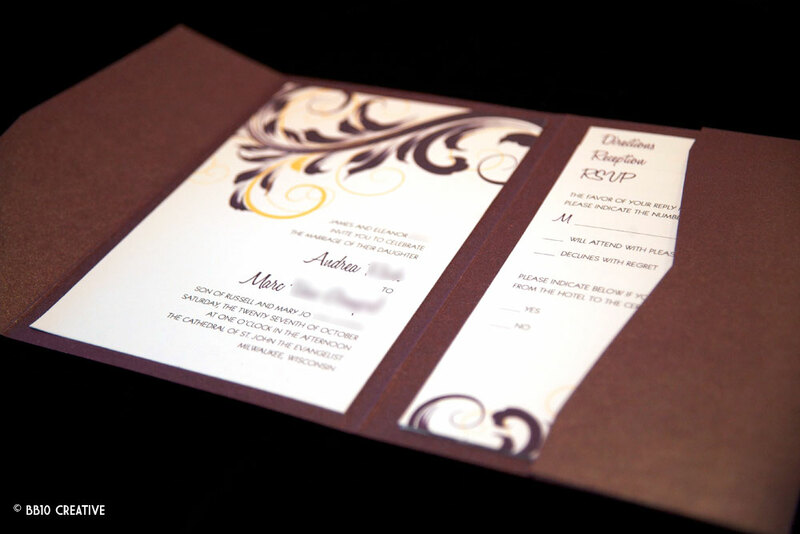 Panel pockets consist of one solid piece of cardstock with room for the invitation card on one side, and a panel on the back side. 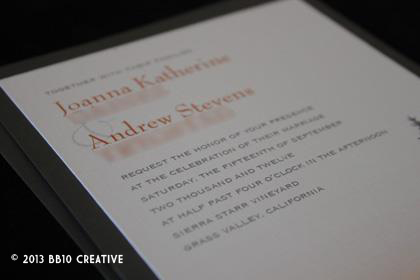 This worked perfectly for Joanna and Andy’s invites, as it came in a nice slate gray color in a matte finish. Matte finish enclosures are perfect when you are looking to incorporate more natural textures or designs. 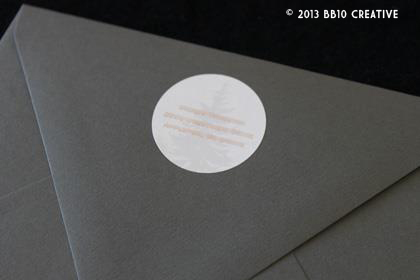 The invitation was sent in a matching gray matte envelope with a custom return address sticker on the back. 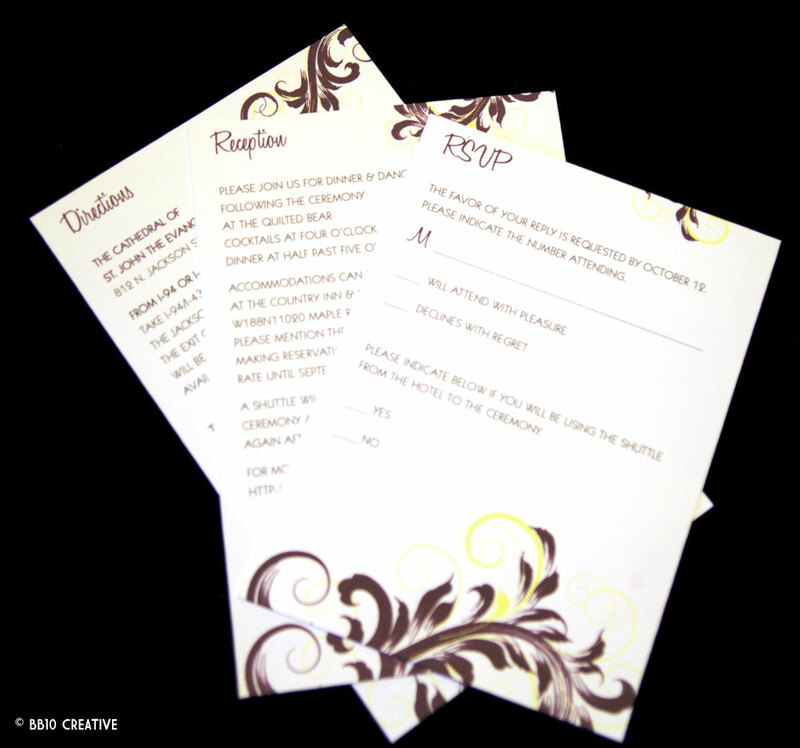 Coming up next we have another eggplant wedding invitation design to feature from 2012, and then we move on to the new designs coming up for 2013! So far we have a peacock theme, baseball theme, two tropical themes and another simple and lovely gray and yellow invitation. 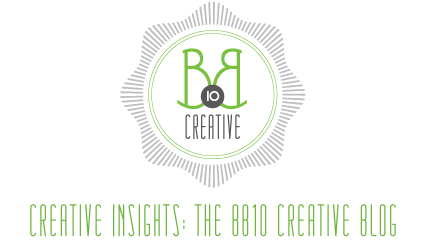 Be sure to follow us on Facebook for all the latest BB10 Creative news, to find helpful invitation tips and connect with some of our preferred vendors! Our new Pinterest board is also seeing a lot of repinning action – share your ideas there too! 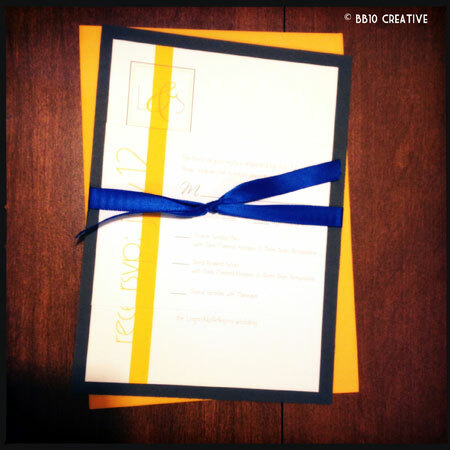 Allyson came to BB10 Creative looking for invitations to fit her Pittsburgh themed wedding. There are many cases in which clients need custom invitations because they are unable to find something “out of a box” that fits their needs. Luckily that’s exactly what we are here to solve. Every one of our invitations is customized to fit your unique wedding needs and themes. Back to Pittsburgh… Allyson and her fiance wanted to incorporate the Pittsburgh Steelers’ team colors of black and gold (or dark yellow) into their wedding, especially since the reception was being held at Heinz field. However, they didn’t necessarily want a sports theme in the design. 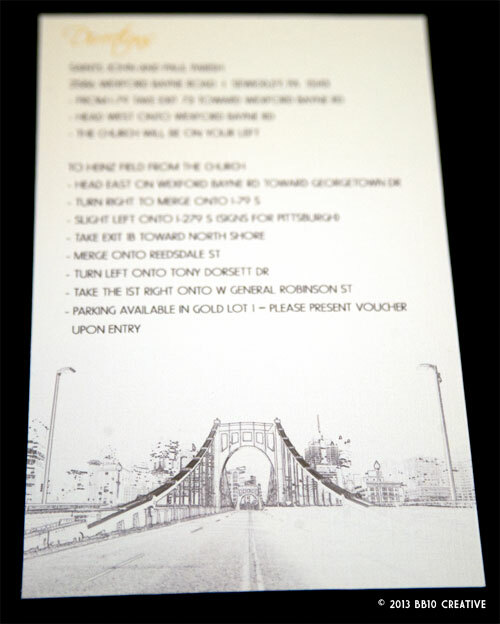 The final design chosen uses some iconic features of Pittsburgh on each card, displayed as hand etched drawings. 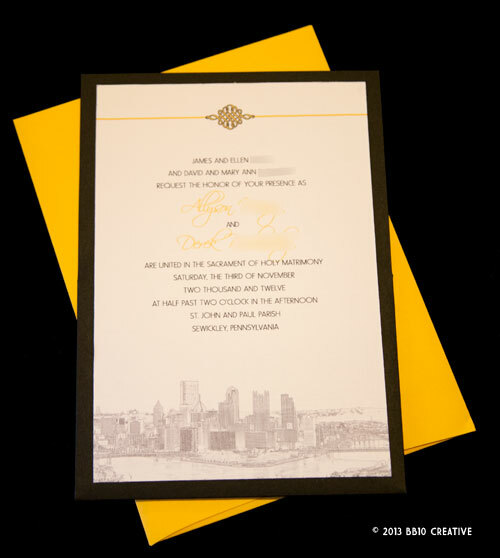 The main card uses the city’s skyline, the reception card uses an image of signage at Heinz field, the directions card uses one of Pittsburgh’s many bridges. 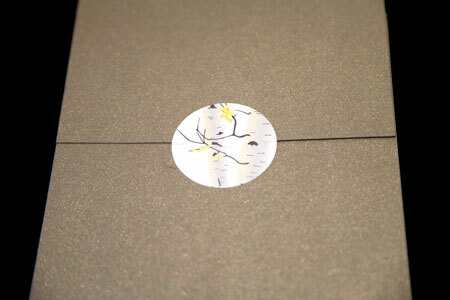 We also used a simple design ornament across the top of the cards to incorporate some of the yellow in the design. Since Pittsburgh is the steel city, I chose one reminiscent of the time period when steel was the cities’ main industry. 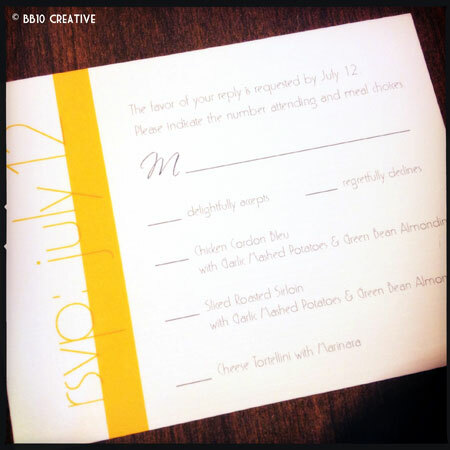 The invitation was housed in a black panel pocket enclosure, printed on a clean white linen cardstock (adding some artistic value to the sketch images), and was mailed in a coordinating yellow envelope. Allyson also had a unique need for her invitation, the guests were required to present a special ticket in order to park at the stadium, so we created a coordinating ticket that was applied to the back of the invitation with a removable glue dot (I like to call them snot dots). Overall this invitation was very simple yet very elegant and still incorporated all the themes and colors Allyson was looking to use. It is a good example of using a theme that you might not think would fit the bill for an elegant affair but can still turn out better than expected! Up next we have a fall themed wedding invitation! I had previously blogged about Susan and Aric’s wedding in my Save the Date post. Susan is a good friend from my college days at Marquette and I was so honored to be helping out with her wedding materials and couldn’t wait for her big day! 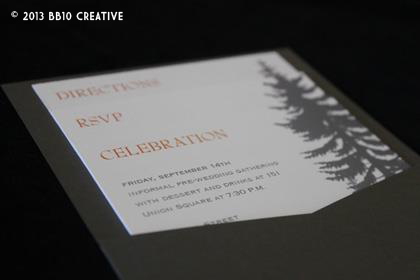 Susan had a very specific idea in mind when she first came to BB10 Creative for her invitations. The ceremony and reception took place at a resort in northern Wisconsin where Susan has been going on family vacations her whole life. So naturally she wanted to incorporate a design that would reflect the location while still being elegant enough for a wedding. Specifically, she was very interested in incorporating designs with birch trees or birch bark. 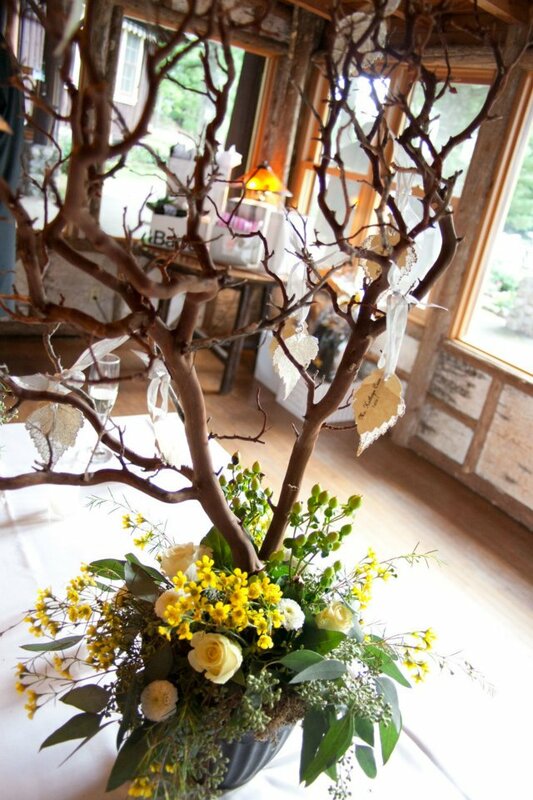 The final design Susan and Aric decided on uses this elegant birch tree design that includes their wedding colors of charcoal gray with yellow accents. We used a more formal script font paired with an elegant serif for the text, and printed the invitation on a clean white linen cardstock. 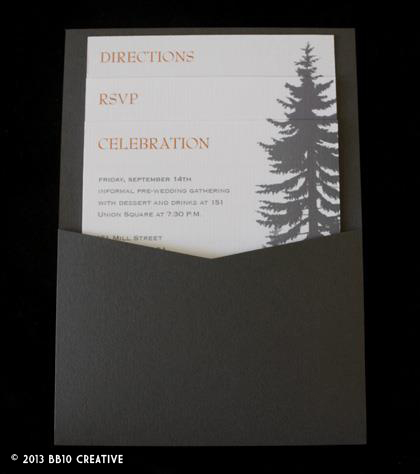 The invitation is mounted on a metallic charcoal gray vertical pocket enclosure and was sealed shut with a custom sticker using the birch tree design. The whole package was mailed in a matching charcoal gray metallic envelope that Susan had addressed by a professional calligrapher. As a side note, I do often get asked if BB10 Creative offers hand addressing or calligraphy. While we do offer mailing services, we do not offer hand addressing, and our invitations are mailed out either using labels or printing directly on the envelope, depending on the materials used. Back to Susan and Aric! Overall, I was really pleased with how this invitation turned out. It may be hard to see in the pictures, but the subtle shading on the birch trees with the yellow leaves ended up being the perfect elegant design for their theme. I was also lucky enough to be one of the guests in attendance at the beautiful wedding and thought I would post some additional photos to show how Susan tied the theme all together. 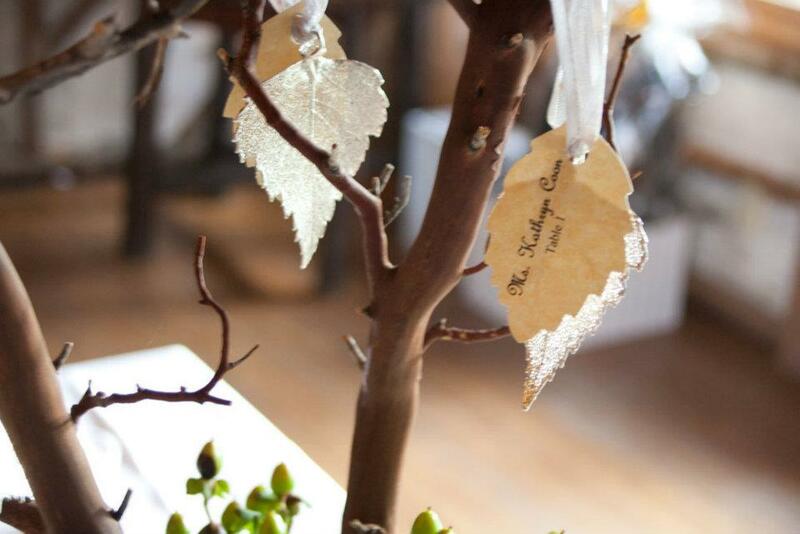 Leaf shaped place cards were hung from these tree branches with ribbon. So elegant! Close up of the place cards. 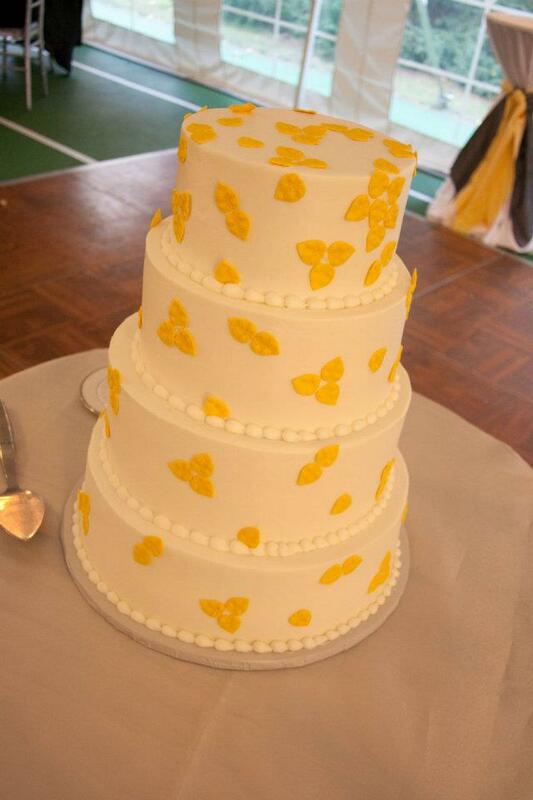 The cake, decorated with yellow leaves. 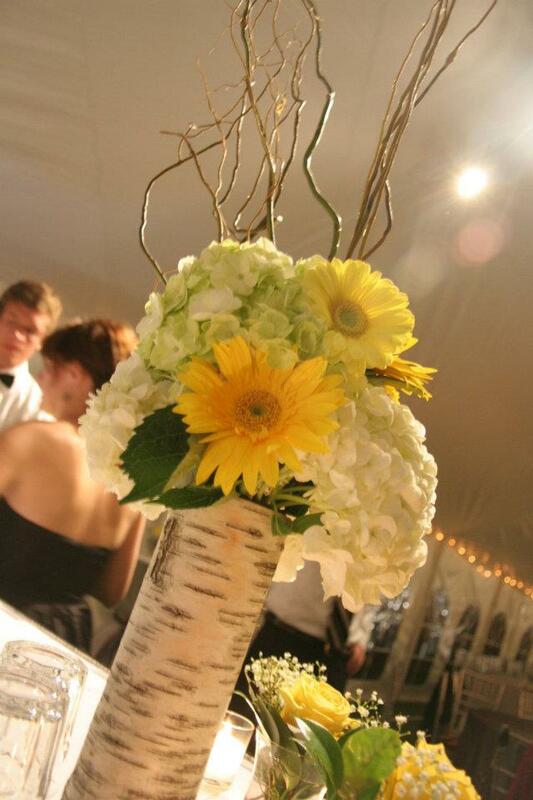 Beautiful Birch Tree Themed Centerpieces! Don’t forget to follow us on Facebook, more of the recent work has been posted there!